With summer approaching, it's important to know the best places to cool off. And while Vancouverites can't always expect a warm season, the city has plenty of great places to go for a dip inside, too. Kitsilano Pool is among Vancouver's most popular outdoor facilities. Located at the western edge of Kits Beach, it's the only salt-water pool in the city. It has three slides, a concessions stand, and to top it off, a beautiful view overlooking the ocean. It even has a "Showboat" stage for summer concerts. The pool opened May 18 for this year's season, and public swim hours are from noon to 8:45 p.m. Monday to Friday, and 9 a.m. to 8:45 p.m. Saturday and Sunday. For a rainy day, there's the Hillcrest Aquatic Centre, which was built as the curling centre for the 2010 Olympic Games and later converted to a community centre. Hillcrest is the largest aquatic centre in Vancouver. It has a gorgeous, wood-framed indoor pool with a slide, three diving boards and a kids' pool with water toys and sprays. It's open year-round and public swim hours are from 6 a.m. to 9:45 p.m. During the summer months, the small, but lovely, outdoor pool is opened, with plenty of sun loungers and grass available to sprawl out on. For a more natural experience, try the 30 Foot Pool in Lynn Canyon Park on the North Shore - it's a perfect place to escape the city rush. The park is open from 7 a.m. to 7 p.m in the spring and 7 a.m. to 9 p.m. in the summer. For more exuberant family fun, make a splash at Watermania in Richmond's Riverport entertainment complex. It's a massive aquatic centre equipped with a wave pool, water slides and a hot tub. It's open year-round, from 6 a.m. to 10 p.m. every day. Whether to cool off, work out or just spend time with family, Vancouver and the surrounding area have more than enough choices for pools. Nestled at the west side of the uber-popular Kits Beach, Kits Pool has a lengthy pool, slides and a breathtaking view of the North Shore mountains across Burrard Inlet. It's a heck of a drive to get there, but Watermania is worth the trip. Richmond's biggest aquatic centre is located at the Riverport entertainment complex alongside the Silvercity Theatre and The Zone Bowling Centre. It has a wave pool, massive waterslide, hot tub and party rooms. You have to be a guest to use it, but this pool is worth the room rate on its own. The Fairmont Pacific Rim's rooftop outdoor pool at the Willow Stream Spa is an oasis of comfort while you're staying in the city. With this kind of luxury, don't be surprised if you run into James Bond. Surrey's Newton Wave Pool is no longer the only game around, but it's still a great one. The facility boasts what it calls the biggest waves in western Canada and its waterslides are both epic and terrifying for young ones. You could call this one of the best legacies of the 2010 Olympics: a massive sporting complex across from Queen Elizabeth Park with a gorgeous, wood-framed indoor pool. It's the biggest aquatic centre in Vancouver. If the ocean isn't your thing, you can always take a dip in the family-friendly Second Beach outdoor pool at Stanley Park. It's a massive pool so there's plenty of room for hundreds of families to visit on a given day. Positioned along the seawall, it also has a great view of the ocean. It's a bit of a trek to get to 30 Foot Pool, a remote and beautiful wading pool in Lynn Canyon Park, the very same park where you find the Capilano Suspension Bridge. The Robert Lee YMCA in downtown Vancouver has a beautiful UV-filtered indoor pool. It has a moving floor to accommodate people of all ages. And for those who don't want to do lengths, there's also a hot tub and steam room. Like Hillcrest, the West Vancouver Aquatic Centre is a beautiful wood-framed building, with a pool boasting features such as a waterslide, a spray park for the kids and a European-style sauna and steam room. Seriously, this place has everything. Call this the best of both worlds. UBC's aquatic centre has both an indoor pool that has hosted many a competitive swim meet, and an outdoor pool with three-metre and five-metre diving boards. 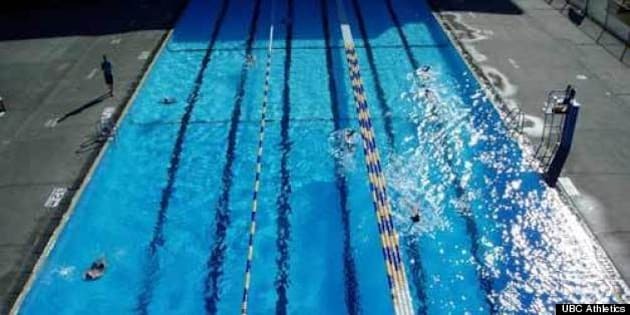 The outdoor pool has also hosted many swim meets, but it's better known for drunken students jumping off the diving boards naked at 3 a.m. And getting arrested. Because, you know, it's funny.